"Lodestar' (Charles H. Hall, 1925) TB. Midseason bloom. Color Class Y9D. ('Gajus' x unknown) x 'Iris King'. Award of Merit 1927. 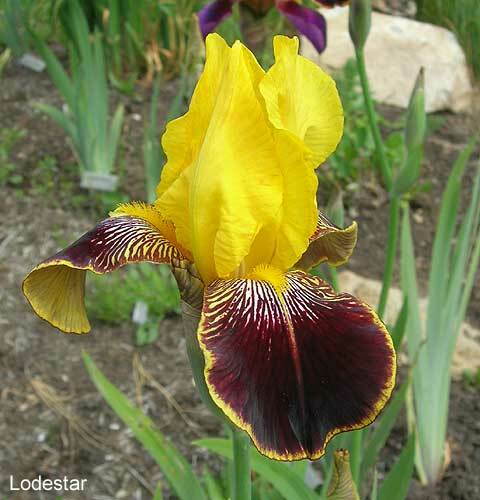 From C. H. Hall catalog, 1925: LODESTAR (1925)- S. lemon chrome; F. velvety claret brown with lemon chrome border. The flowers are of ample size and fine finish, with Standards of remarkably clear color. 36 inches. $5.00. Delivery after July I, 1925. From Carl Salbach's catalog for 1939: "Easily the best and brightest of all small variegatas. A fine doer everywhere and not only bright, but very rich. Bright yellow standards, clear red brown falls, highlighted by vivid gold edging. Very clear in color, and although a small iris it is one of the most outstanding of all iris - one that should be in every garden. Rhizomes always small. 24-inch." JPG lodestar01.JPG manage 485 K 26 Jun 2018 - 19:45 Main.TLaurin Photo by Nancy McDonald-The Pickle Barrel Collection.